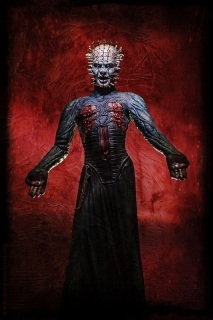 HELLRAISER - PIN HEAD STATUE 18"
According to Clive Barker and Doug Bradley, the earliest incarnation of Pinhead appeared in Hunters in the Snow, an original 1973 play with Doug Bradley in the rôle of the Dutchman, an undead inquisitor and torturer. 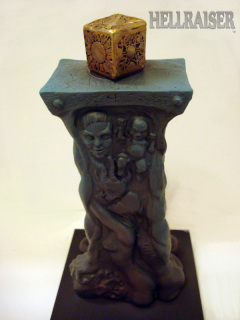 A later film titled The Forbidden, which was shot in 16 millimetre and in black and white, included a prop in the form of a wooden block with six nails in it, which gave distorted shadow formations under different lighting angles. 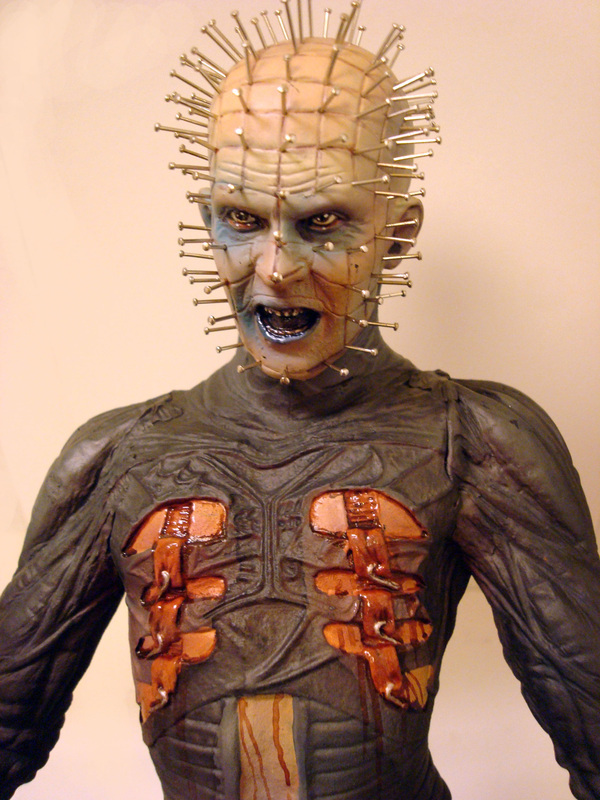 Years later, during the scripting of Hellraiser, the same design would be applied to Pinhead's face to give the same effect. After being disappointed with the way his material had been treated by producers in Underworld (which included a scene in which needles burst out of a character's skull), Barker wrote The Hellbound Heart as his first step in directing a film by himself. Base: solid wood with padded feet. 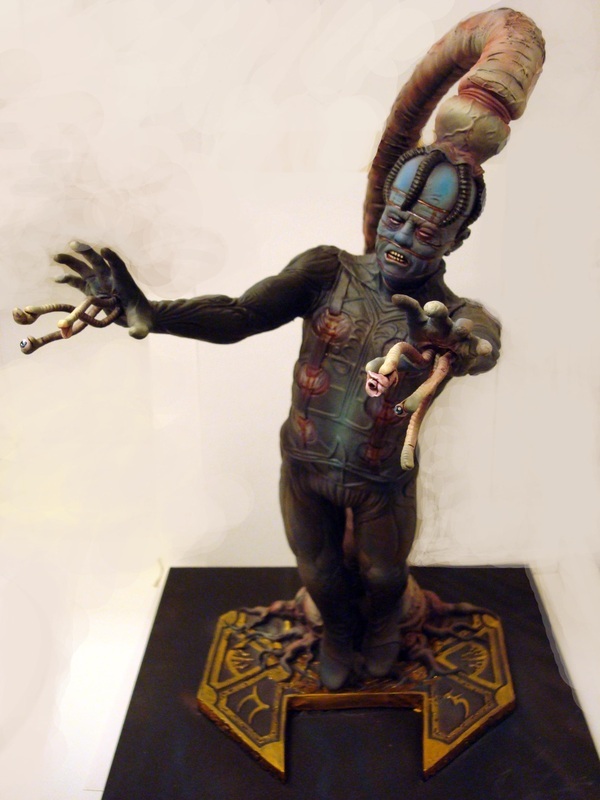 This piece is in the private collection of Emile Binedell. 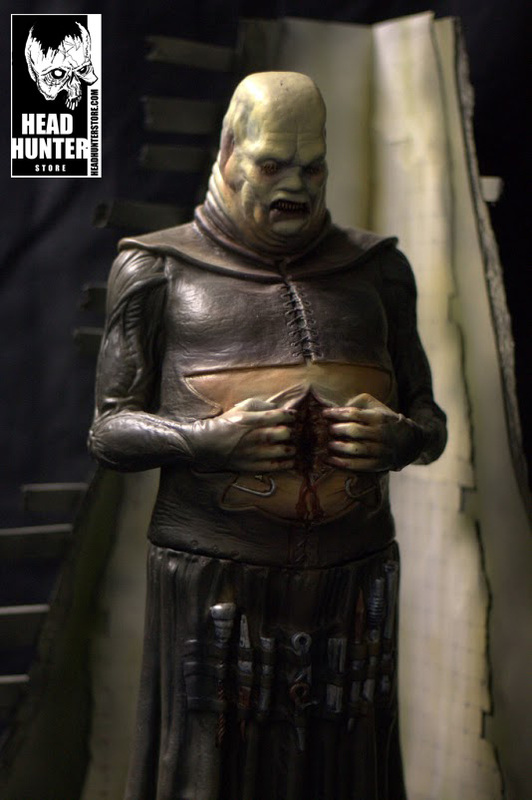 HELLRAISER - BUTTERBALL CENOBYTE 18"
Laslo was a despicable character when he was human. Disappointed with his over eating and his waste of his talents, he was probably such a failure because of his gluttony for sin and perverse pleasure. However, he could not stop eating much more than he needed for his own personal pleasure, and seeking much more pleasure as well. 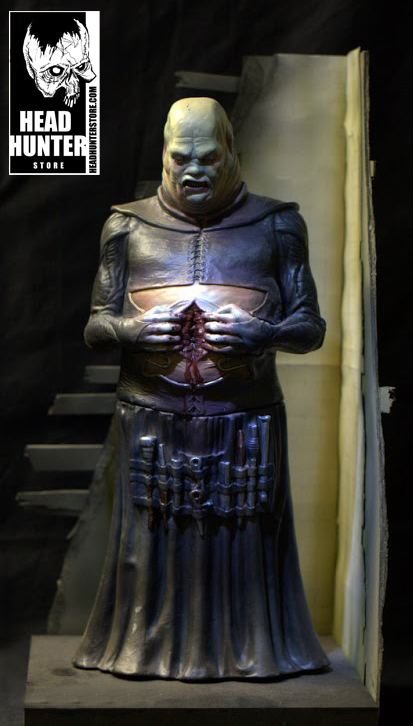 When he first saw the Lament Configuration it attracted him promising all he could ever desire, but when he unlocked the secrets of the box, it only brought him pain teaching him a whole new way of life. 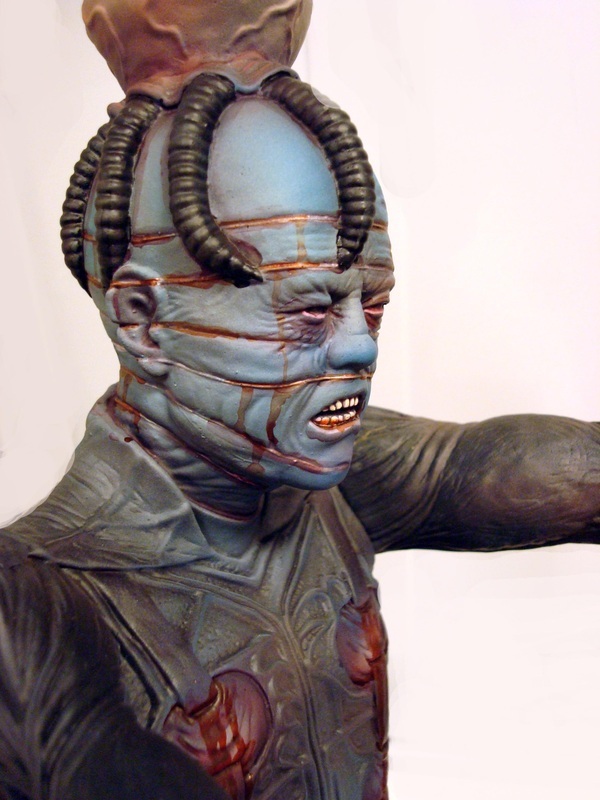 Laslo had become a cenobite, and a member of Pinead's original gash. 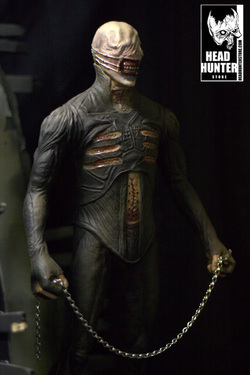 HELLRAISER - CHATTERER CENOBYTE 18"
Chatterer is a member of the Cenobites, formerly-human monsters dedicated to exploring the limits of human sensation; these "explorations" take the form of extreme sadomasochism, to the point that it is considered torture by most of those whom they encounter. 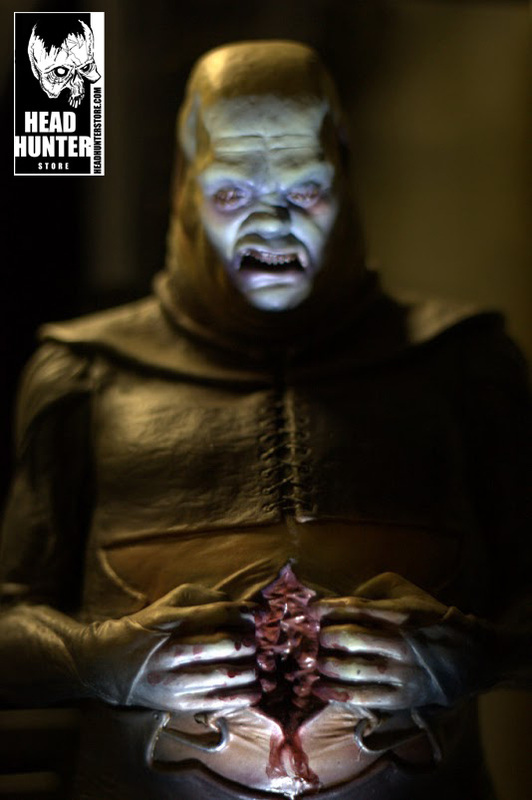 He lives with his fellow Cenobites in an extradimensional realm called Hell, a gigantic labyrinth accessible only via a puzzle box called The Lament Configuration, which opens a dimensional fissure. 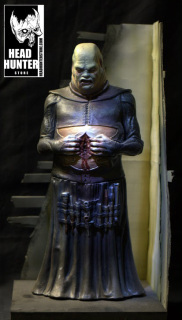 While those who possess unique qualities conducive to the Cenobite agenda are transformed into Cenobites upon opening the box, others are subjected to the Cenobites' "experiments." Like his fellow Cenobites. HELLRAISER - FEMALE CENOBYTE 18"
Like the other Cenobites, she is clad in black leather and is mutilated. 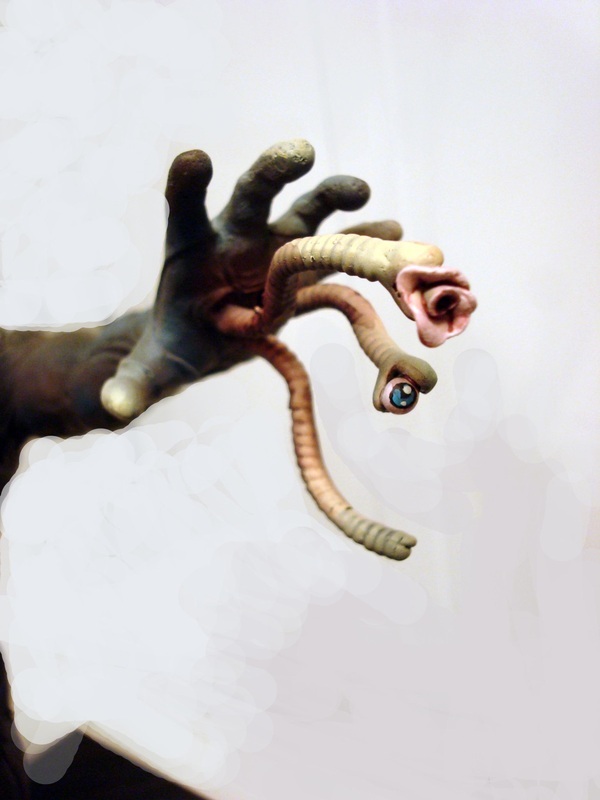 In the original film, several wires peel back the skin around her neck, causing her to have a raspy, whispery voice. 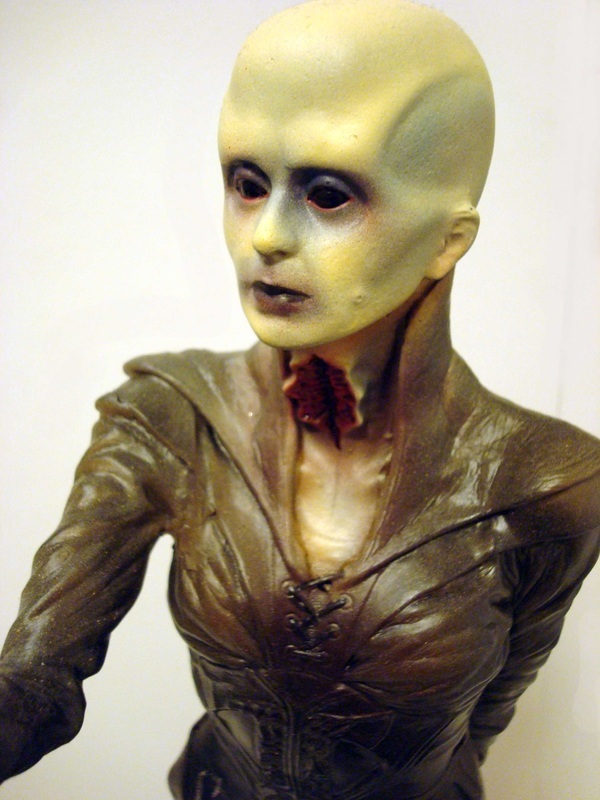 She is given deeply sunken facial features with bluish skin and a few hairs left on her head. 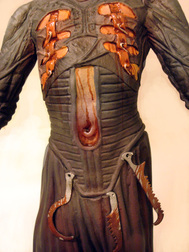 In the sequel four of the wires holding her throat open have been removed, leaving just one frame, and her skin tone is made white with no hairs on her head. When she is killed at the end of the second Hellraiser film (after Channard throws a knife into her open neck wound), she reverts to her original human form, revealing that she had once been a pretty woman. 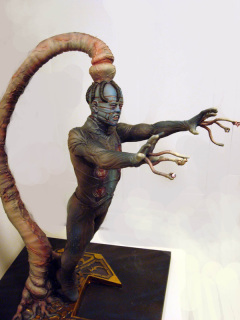 Dr. Philip Channard was a psychiatrist who ran the Channard institute, where patient Kirsty Cotton tells him about the Cenobites. At his home, it is revealed that Channard has the mattress on which Kirsty's step-mother, Julia, died. Channard's assistant, Kyle, sneaks in to his house to find that Channard was obsessed with the Lament Configuration box and the portal to Hell. Kyle watches as Channard brings back a patient from the ward as a sacrifice for Julia's resurrection. Channard brings Julia back more corpses for her to feed on: she now has her skin back. He goes back and informs Kirsty about what he saw and that he now believes her. They go to the house together, as Kirsty finds a picture of Captain Elliot Spenser before becoming Pinhead. Kyle runs into Julia: at first he has no idea who she is before realizing too late. Julia and Kirsty finally meet again, and Julia smacks Kirsty as Channard brings another victim: Tiffany, a mute girl that Kirsty befriended. It is revealed that Tiffany isn't another victim, but a tool Channard uses to open the box, who happens to be skilled in solving puzzles, so Channard can experience Hell. 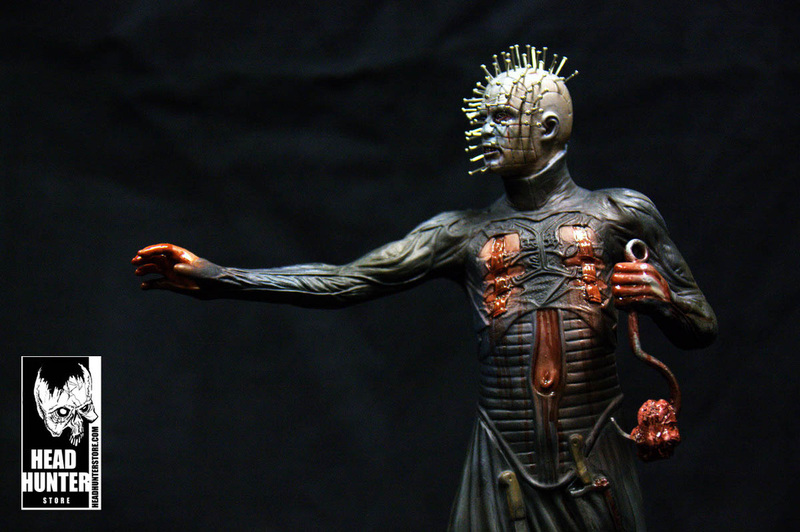 The Cenobites are released, but Pinhead stops the others from killing Tiffany, for he notes that it is not her desire that made her open the box but Channard's. Kirsty wakes up from being knocked out by Julia and, after seeing what has happened, heads for Hell with the box. 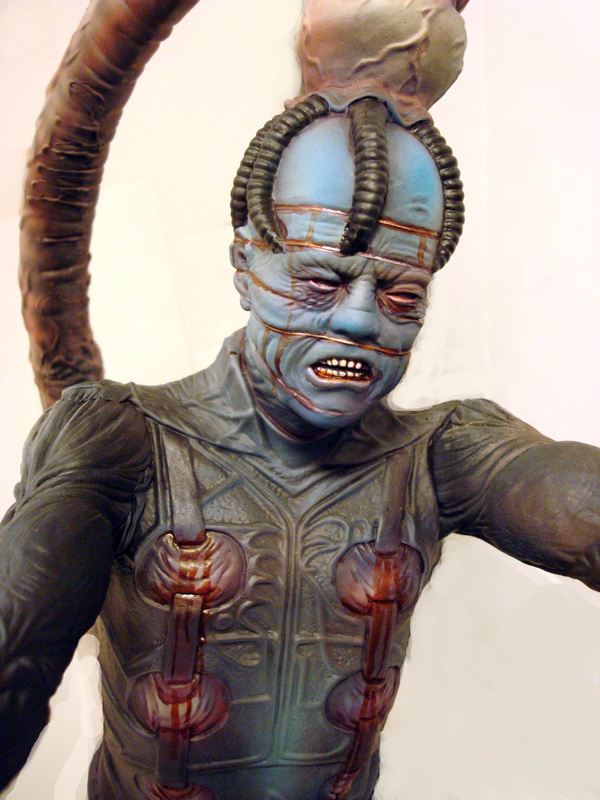 Channard is eventually betrayed by Julia and turned into a Cenobite. Base solid wood with padded feet. Base: solid wood, with padded feet. All 1:1 are all hand made Fan-requested pieces, to customer specification, all prices are therefore for comparative purposes. 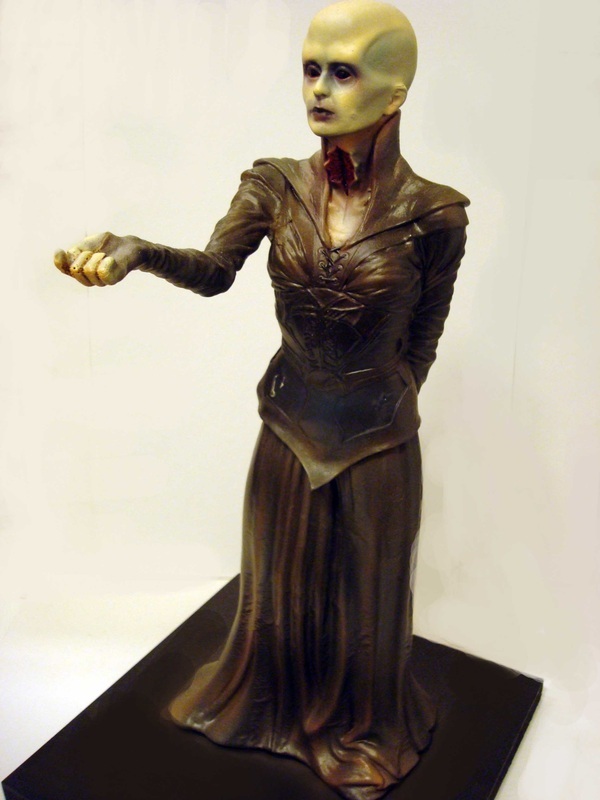 All statues are made from fully licensed kits, posed and painted to customer specification. 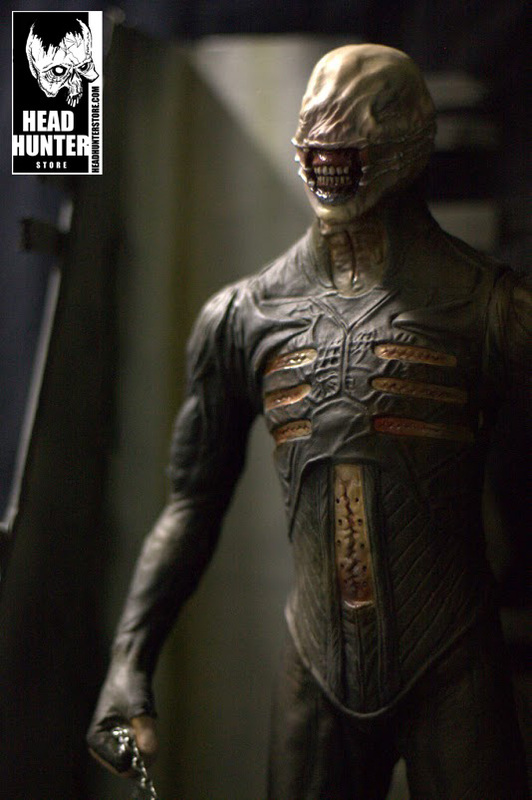 All Action figures, toys and collectables are licensed items.